Elder Von G. Keetch, General Authority Seventy, passed away on January 26, 2018 after a courageous fight with cancer. He was 57 years old at the time of his passing. Elder Keetch was sustained as a General Authority Seventy of The Church of Jesus Christ of Latter-day Saints on April 5, 2015 and was serving as the Executive Director of the Church’s Public Affairs Department at the time of his death. of traveling continued to grow throughout his life. Elder Keetch spent much of his youth working on his grandparents’ farm—picking fruit, taking care of expansive vegetable gardens, and learning to work hard. He attended Pleasant Grove High School and excelled in every aspect of his life, including in the classroom. It was in high school where he met his future wife, Bernice Pymm. In 1979, He was called to serve in the Germany Düsseldorf Mission. Soon after his return he was sealed to his high school sweetheart, Bernice, in the Salt Lake Temple on November 21, 1981. Bernice and he were blessed with six beautiful children: Steffani Anne (Brian Dastrup), Alyson Mariah (Jarom Ball), Jared Von (Anna Spencer), Tyler Gary (Megan Hoyt), Cameron John (South Africa Cape Town Mission), and Kaden Merrill. They also have six wonderful grandchildren and one on the way. Elder Keetch was a brilliant student and lawyer. 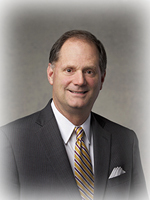 He received a bachelor’s degree in political science from Brigham Young University in 1984 and a juris doctor degree from BYU Law School in 1987, graduating first in his class. Immediately after graduation, he began practicing law with the prestigious Washington D.C. law firm of Sidley Austin. He was then selected as a judicial clerk in New York City. Subsequently, he was chosen as a judicial clerk to Chief Justice Burger and Justice Scalia of the United States Supreme Court—a position of enormous responsibility and the highest honor a young lawyer can receive. As a gifted attorney, Elder Keetch chose to use his talents to assist the church he loved. He returned to Utah in 1990 and for the next 25 years represented The Church of Jesus Christ of Latter-day Saints as a shareholder with the Salt Lake City law firm of Kirton McConkie. He soon became the Church’s primary outside legal counsel. During a quarter-century of challenge and change, Elder Keetch advised the Church on most major legal issue, working closely with his dear friend and Church General Counsel, Elder Lance B. Wickman. Elder Keetch was a widely recognized expert on First Amendment rights. In one form or another, he represented the Church and several other faith groups on a variety of legal issues, including his efforts on the “fairness for all” initiatives. He was very active in community and civic affairs, and beloved by countless friends and associates. To his colleagues in the legal community, especially those at the Church’s Office of General Counsel and Kirton McConkie, Elder Keetch was much more than a brilliant attorney. He was a beloved friend and example who combined rare intellectual gifts with wisdom, kindness, a ready laugh, and deep reservoirs of faith. Elder Keetch served as the president of the BYU 14th Stake for many years. He loved serving with the amazing people there and enjoyed interacting and teaching the youth of the Church. As a son, husband, father, grandfather, and dear friend, Elder Keetch lived an exemplary life, showing compassion and love for others. He was a true disciple of Jesus Christ and dedicated his life to serving Him. Elder Keetch is preceded in death by his grandparents, Vernee David and Bessie Melissa Young Keetch, and Merrill Newman and Lyle Kofford Crandall, and his Father-in-law John Howard Pymm. He is survived by his parents: Gary and Deanne; Siblings: Kathy Lee, Gregory C, and Melissa Ann; his beloved children and grandchildren; and his wife Bernice. He will be sorely missed by all who were blessed to know him. But most of all, Elder Keetch will be missed as a wonderful husband to his sweetheart Bernice. Always working together, hand in hand, they created a celestial relationship built on trust, selflessness, and truly being each other’s best friend. Funeral services will be held Friday, February 2, 2018 at 11:00 a.m. in the Highland Utah East Stake Center, 4679 West 11000 North, Highland, Utah. Family and friends may attend a viewing Thursday evening, February 1, 2018 from 6 – 8 p.m. at the stake center and on Friday from 9:30 – 10:45 a.m. prior to funeral services. Interment will be in the Pleasant Grove City Cemetery under the direction of Olpin Family Mortuary, Pleasant Grove. Condolences may be sent to the family at www.olpinmortuary.com.